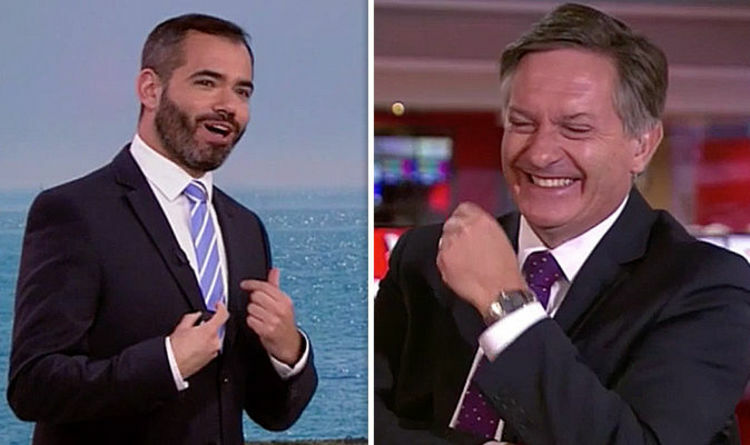 BBC News presenter Simon McCoy and BBC Weather forecaster Ben Rich were both left uncontrollably laughing after the comment. Rich joked that he was forced by the BBC to “chat” with McCoy before he delivered the news. The dig left the BBC presenter in stitches before the BBC Weather forecaster struggled to stop giggling. McCoy stated by pointing out the weather for the UK was “livening up” following the glorious heatwave. Rich said: “It is livening up. Lots and lots of changes on the way. McCoy, known for his hilarious on-air interactions was quick to point out it was the BBC Weather forecaster who had been talking about the hot weather. Rich responded with a brilliant quip in a mocking tone leaving the pair laughing. McCoy claimed that he was “just trying to keep quiet” before he told the BBC Weather forecaster to “go on”. Rich warned about temperatures in the UK dropping after the country had been hit by highs of 33C on Tuesday.